Alongside band mates Brian Jones and Bill Wyman, Mick Jagger was famously charged in 1965 with "insulting behavior" for relieving himself in public. It was an episode that cemented the Rolling Stones' bad boy image, delivering fans the proof that the Stones were absolute rebels. Shortly thereafter, the band's song "(I Can't Get No) Satisfaction" became a worldwide smash and the anthem of an entire generation. Calculating the worth of a particular provocation has long been the specialty of the band's front man, Mick Jagger, a former business student at the London School of Economics. Mick Jagger combines two talents that don't always harmonize. On the one hand, he's the cool and cunning businessman; but he's also the charismatic lead singer of a band whose image has always been bound up with scandal. One of Jagger's clever calculations was to play up the band's rebellious side since the Beatles had already dominated the charts with their boy-next-door image. Today, even Jagger himself can probably no longer separate intended theatrics from what became reality. He likes to downplay the band's scandalous era, saying they were just a teen band who didn't set out to contrive a bad boy image. But for Jagger's friend and Stones co-founder and guitarist Brian Jones, that era was characterized by escalating drug and alcohol addiction that lead to his death in 1969 at only the age of 27. Together with Jones and their mutual friend Keith Richards, Mick Jagger had started the Rolling Stones after first getting his feet wet as a singer in Alexis Korner's blues band. Legend has it that Mick Jagger and Keith Richards met at a train station in Dartford in the county of Kent, where the Stones' future lead singer had been born on July 26, 1943. On that fateful day in 1961, Jagger found himself on the way from his hometown to the London School of Economics, where he was enrolled as a student. 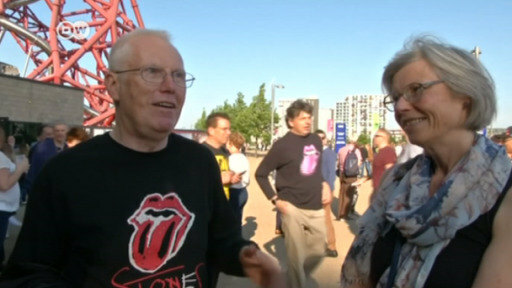 Richards, whom Mick Jagger knew from school in Dartford, also wanted to head to London the same day. The two decided to meet up again and make music. About a year later, the Rolling Stones were born. Mick Jagger and Keith Richards have continued to collaborate in the writing of the band's biggest hits up to the present. As songwriting teams go, they're comparable perhaps only to John Lennon and Paul McCartney. With his exalted stage presence, Jagger lends the Stones an unmistakable trademark, while Richard serves up the band's one-of-a-kind guitar riffs. It was in 1965 that Mick Jagger and the Rolling Stones first took the stage in Germany, giving a concert in Münster on September 11. The audience was euphoric — just as fans had been during tours in England and the United States before. Four days later, it was clear to Germany, too, just how much rebellious potential the band was capable of unleashing. The Stones' concert at Berlin's Waldbühne ended with the total destruction of the venue. Police officers and fans skirmished for hours, and the amphitheater itself wasn't rebuilt and put back into operation for seven years. The group's lead singer has a private life that is no less storied than that of his band. In 1970, he told the German magazine Musik Express that he had no intentions of settling down for a bourgeois life with a wife and children. One year later, he was married to Bianca Perez Morena. His first daughter, Karis, was born around the same time, in 1970 — however, to singer Marsha Hunt. Jagger's first marriage held until 1979 and the divorce cost him an estimated 2.5 million dollars. His second marriage to former model Jerry Hall lasted from 1990 to 1999. Other liaisons followed, such as a relationship with the American fashion designer L'Wren Scott. Currently, Jagger is going out with dancer Melanie Hamrick, who is 43 years his junior. Jagger has fathered at least eight children, fathering his youngest son with Hamrick in 2016. He is a grandfather twice over as well as a great-grandfather, but there seems to be little time for his big family. If he's not on tour with the Rolling Stones there's usually a solo project in the works, or the iconic singer can be found performing with famous colleagues. In 1985, Mick Jagger followed in the footsteps of other band members by releasing his first solo album, She's the Boss, which struck the right chord with fans. Further albums followed, including a "Best of" in 2007. The list of artists with whom he has collaborated since 1972 as a musician and singer is as long as it is dazzling. Names like Carly Simon, Tina Turner, Jerry Lee Lewis or David Bowie are included. It was with Bowie that Mick Jagger recorded the worldwide hit "Dancing in the Street" in 1985 as a benefit project for Live Aid. Mick Jagger has also appeared in films ever since his 1970 debut in Kelly, the Bandit. In 2001, he worked with George Hickenlooper on The Man from Elysian Fields, and even played a drag performer in Berlin during the 1930s in the 1997 drama Bent. German film director Werner Herzog once said of Jagger, "People have never given him enough credit as someone who could have been very big as an actor." But maybe it's never too late. In 2003, Jagger repeated a special reward for his restless artistic spirit. Prince Charles knighted him, citing his "services to popular music." So it's now Sir Mick Jagger, if you please. As for The Rolling Stones, their story is still not at its end. The band is on tour again in 2018, having recently completed the second leg of their "No Filter" world tour, which included two stops in Germany. The concerts, however, were less of a show of their rebellious nature and more of a premium attraction — at premium ticket prices ranging from 112 to 500 euros ($140 to $585) a pop. Sir Mick the well-heeled businessman is once again taking center stage. While many of his peers have long retired, Mick Jagger, who turned 75 on July 26, is still strutting the big stage like he's 25. And according to Keith Richards, Jagger and the band have no intention of slowing down any time soon. Anita Pallenberg, an actress and model best known for her relationship with the Rolling Stones, has died at the age of 73. The German-Italian actress had three children with Stones guitarist Keith Richards.